If you ask any fertility acupuncturist about how they go about treating fertility, I imagine you'd get a similar response: Chinese Medicine helps bring the body back to balance by uncovering and addressing the root cause to treat symptoms affecting the entire body. That’s what makes it "holistic" and such a powerful and effective tool for complex issues like fertility. Conventional medicine often misses these minute imbalances, which is why Chinese Medicine is such an effective addition to integrative care. The modern reproductive medicine approach is often performed in isolation. They manipulate and control certain specific variables hoping that this will overcome fertility challenges, even if they don't understand the root cause of the challenges. If you’re going down the assisted reproductive technology rout, it can feel like giving your body, and control, over to the tests and procedures. It’s important to remember while some things are out of your control, many things are in your control and lifestyle is one of them. 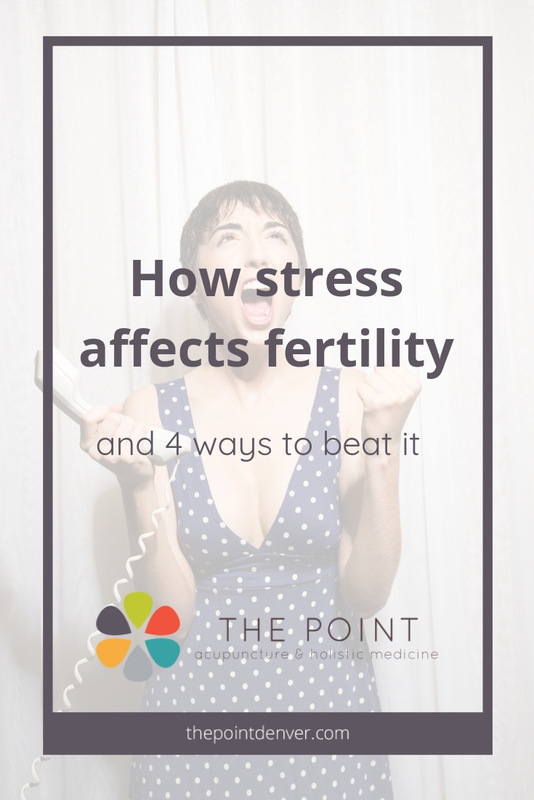 Stress is one aspect of fertility you can manage. Chinese Medicine looks at health as involving body, mind, and spirit. We see these as interconnected, and that mind and spirit can absolutely lead to symptoms and imbalances in the physical body. Therefore, we must balance all of these - the mind and spirit, not just the body - in order to achieve optimal fertility. Modern research supports this theory and proves that stress absolutely affects fertility. Studies show that stress reduces conception probabilities during the fertile window [https://www.ncbi.nlm.nih.gov/pubmed/20688324], is linked to longer time to pregnancy, increasing the risk of infertility [https://www.ncbi.nlm.nih.gov/pubmed/24664130], and stress is also linked to early pregnancy loss [https://www.ncbi.nlm.nih.gov/pmc/articles/PMC1533790/]. Why does stress affect fertility? The research shows that stress negatively impacts fertility, but how does it do this exactly? There are many mechanisms through which stress affects fertility - stress reduces blood flow to the uterus and ovaries, stress can delay ovulation, and one of the biggest ways it affects fertility is by reducing progesterone levels through something called the "pregnenolone steal". The "pregnenolone steal" is the term used to describe how your body robs from progesterone in order to give more to cortisol when you're under stress. Your body uses the same building blocks (cholesterol and pregnenolone) to create both cortisol and progesterone. When you're under stress and your body needs to pump out more cortisol (the stress hormone), if funnels pregnenolone to make cortisol, making it unavailable for the production of progesterone. Your body sees cortisol as the priority, and progesterone suffers. Progesterone is the hormone that holds your uterine lining intact. When it's low it can lead to short luteal phases (which can prevent implantation), spotting before your period comes, and miscarriage. A healthy progesterone level is essential for fertility. I think that an understanding of this process helps to clearly paint the picture of how stress affects fertility. It's not just a vague idea of stress being "bad", it makes it more concrete and even measurable. (You can get your DHEA levels tested to give you a picture of if chronic stress could be affecting your hormones - it should be in the 200 -300 range). Fertility and conception are complex and can be affected by hundreds of factors; and clearly, stress is a major factor. This can be frustrating to hear because trying to conceive itself can be incredibly stressful, especially when it takes longer than you hoped. It can feel like we’re in a Catch 22. Often times, it’s just NOT as simple as “relax and you’ll get pregnant” - that can be one of the most infuriating things to hear from someone who’s trying to “help”. Fertility is complex, and it’s rarely as simple as “just relax”. With that said, stress can affect our hormone balance and the research shows it can negatively affect fertility outcomes. So let’s address it! Because, while we can’t eradicate all stressful circumstances and events from our lives, we can learn to manage our stress and mitigate the effects of stress on our health and fertility. That is something that’s within our control. A good place to start may be to first rate your levels of stress from 1 to 10, 10 being the highest. Then think what is causing your stress and write them down, put it out there on paper for yourself to see. Circle which ones you can manage, reduce, reframe, or eliminate. Are there other factors you have missed like over-exercising, poor diet, or lack of sleep, that could be stressful for your body without you being aware of it? What is "stress" and why does it affect our fertility? The term "stress" was coined by Hans Selye in 1936 and he defined it as “the nonspecific response of the body to any demand for change” and later as “the rate of wear and tear on the body” (American Institute of Stress). Stress may be triggered by many things: overwork, financial burdens, worry, diet, environmental toxins, lack of sleep, lack of time, and the fertility process alone can be stressful. Our brains can’t tell the difference between “the tiger is chasing me” and things like “I’m going to be late for work” or “I’m not sure I’ll be able to make rent this month”. For all of these, the brain gets the same “fight or flight” stress signal and the same resulting hormone cascade that floods the brain and body. When this happens it pumps out cortisol, dumps glucose into the blood stream, and brings blood flow to the brain, muscles, and eyes and away from reproductive organs, digestion and reproductive system. The body sees these systems as non-essential. Yes, non-essential. It thinks that running from the tiger is what is essential when it’s in fight or flight mode. We need to remind the body that it’s safe to come out of the fight or flight mode. This way it will resume sending blood flow to the digestive and reproductive systems and hormones will normalize, leading to a better chance of conception. This is what we mean by “stress management” - techniques that tell your brain and body that it can come out of fight or flight mode and into rest, relax, and reproduce mode. Breathwork: We breathe both consciously and unconsciously. Meaning you do it automatically without thinking about it (like your heart beating), but you can also control it if you choose to. That’s what makes it a great loophole into controlling your nervous system. By slowing down and deepening your breathing, you send a powerful message to your nervous system to calm down. It's a great hack. And so so simple. What do you think of taking five minutes a day to consciously take deep breaths and breathe calmly to tap into your parasympathetic nervous system and tell your brain it’s safe to relax? We offer Guided Meditations in Becoming Mama program and Headspace.com also offers an Acceptance Pack that may be helpful. Acupressure: It’s well-researched and proven that Acupuncture is helpful for fertility and for stress, so we absolutely recommend getting acupuncture. And you can also take advantage of the benefits of acupuncture by doing acupressure on yourself at home. Apply pressure with your fingertips or thumb to the point of your choice, press only hard enough that you feel pressure. A favorite is Yin Tang: Located in the center of the forehead, between the eyebrows. This point stimulates the pituitary gland for hormone regulation and balance and may also help reduce anxiety. The Becoming Mama program includes self acupressure programs for Fertility and IVF/IUI. Fertility Yoga: Yoga poses are wonderful to stretch and strengthen the body, but even better, it helps us release stress and tension and increase blood flow. When we over-exercise with long runs, for example, we can actually be adding stress on the body and be unknowingly raising cortisol levels. Yoga is a great exercise because it’s not over-taxing or stressful for the body. Additionally, many yoga poses (hip openers like pigeon-pose and leg-up-the-wall pose, for example) are thought to help improve blood flow to the pelvic area. Another added benefit of yoga is that it involves deep breathing, hitting two stress-relieving birds with one stone. Mantra/Affirmation: Another way to decrease stress is simple: Love Honor and Accept yourself. Try that out now, I love honor and accept myself. How did this feel? Where did you notice it in your body? Mantra is wonderful for overall physical and mental wellbeing. This subtle therapy can be a powerful means of positively influencing the mind and the nervous system and letting it know that it can relax and is safe. There are many ways to use mantra/affirmations. Some of my clients place one on the mirror to see it every day. Others have created a visual board. You can add a mantra to meditation, write one in your journal over and over. You can even choose one for each phase of your cycle. Whether it’s the first time you are learning about this stress-fertility connection or the tenth time, my goal is to leave you feeling empowered. Because the good news is that by mitigating stress it is possible to support the optimal environment for conception and boost your fertility. Stress-management is just one of the many pieces of the Becoming Mama Fertility Program. This is not a quick fix, and it requires implementation from you. What I teach in the 10-day program is designed for you to integrate over a few cycles. 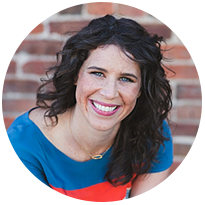 I help you fill in the gaps in your care and specifically design your diet and lifestyle to support your fertility. We look at body, mind, and spirit. As an Acupuncturist and the creator of Becoming Mama program, my goal is for you to take your body back to balance to produce optimally healthy hormones, egg, and sperm, and decrease chances of miscarriage. Again, stress can take us out of balance! By helping you to understand the role of stress you can begin to work with your body to prepare for conception. The Becoming Mama program is a fun, effective, 10-day online program to boost our fertility through food, lifestyle changes, supplements and more. It lays it all out for you and makes it super easy to boost your fertility naturally. Find out more details here. ~ By Jennifer Ward, L.Ac. and Katie Altneu, L.Ac.